President Barack Obama delivered a full-throated defense of the nation's safety net programs and vowed to tackle the issues of climate change and gay rights in his second inaugural address Monday afternoon. "We reject that Americans must choose between caring for the generation that built this country and investing in the generation that will build its future," Obama told the crowd of hundreds of thousands of spectators who descended on the National Mall Monday morning. "The commitments we make to each other--through Medicare, and Medicaid and Social Security--these things do not sap our initiative; they strengthen us. They do not make us a nation of takers; they free us to take the risks that make this country great. "The president also warned in the approximately 2,000 word speech that the country cannot succeed if a "shrinking few" succeed economically while the middle class suffers. As the president began to exit the Capitol stage area after giving his speech, he stopped, turned around and stared out at the crowd gathered on the National Mall. I want to see this "one more time" he appeared to say to his family, according to video of the moment. "I'm not going to see this again." He smiled, lingering for several seconds. The festivities were more muted than four years ago, when nearly 2 million people showed up, but still large for a second-term inauguration. An inaugural official estimated the crowd for the swearing in at 1 million, and Metro officials estimated that about 60 percent as many people used the train system on Monday compared to four years ago. Obama took his oath Monday morning on two bibles, one owned by Rev. Dr. Martin Luther King Jr. and the other by Abraham Lincoln. Civil rights activist and journalist Myrlie Evers-Williams, the widow of slain civil rights leader Medgar Evers, delivered the invocation. During the afternoon's inaugural parade, Michelle and Barack Obama jumped out of the presidential limo on two different occasions to greet parade-goers who were cheering from behind metal barricades. The First Couple led the parade on foot for a few blocks down Pennsylvania Avenue, got back in the limo, then emerged again to walk a few more blocks before being driven to the White House. They then watched the rest of the parade from a heated viewing station on the White House's north side. 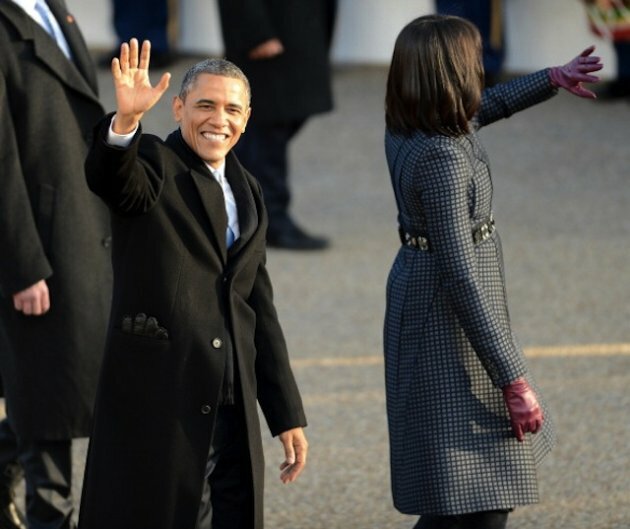 The First Lady wore a navy dress and coat by the American designer Thom Browne and accessories by J.Crew. The outfit will be donated to the National Archives after the inauguration. Despite deep partisan divides in Washington, Republican lawmakers publicly crossed party lines to congratulate the president on Inauguration Day. Senate Republican leader Mitch McConnell (R-Ky.) released the following statement: â€œEvery four years on Inauguration Day, America shows the world that our major political parties can disagree with civility and mutual respect. It is in this spirit that I congratulate President Obama on his inauguration to a second term and wish him well in the fulfillment of his duty to lead the U.S. at home and abroad over the next four years." The First Family attended a luncheon with members of Congress in the Statuary Hall in the U.S. Capitol after the swearing-in ceremony. In brief comments at the luncheon, Obama acknowledged that the politicians in the room disagree on many issues, but thanked the attendees for their service. Obama also thanked his wife. "There is controversy about the quality of our president, but no controversy at all about the quality of our First Lady," he said. Compared to President Obama's first inauguration in 2009, finding a spot at the National Mall to watch the ceremony Monday morning was a breeze. There, inaugural staffers passed out free tiny American flags, while others waved their own version of the Stars and Stripes overlaid with the president's face. With plenty of room on the grass, even families with small children had little problem sprawling out on blankets as others carefully walked around them. On Jumbotron screens placed throughout the Mall, inaugural attendees watched dignitaries, celebrities and lawmakers file to their seats. With each camera shot of Obama and his vice president, Joseph Biden, the members of the crowd lifted up their flags and cheered. Earlier on Monday, the First Family emerged from an 8:45 a.m. service at St. John's Episcopal Church. Obama took time to tweet during church. "I'm honored and grateful that we have a chance to finish what we started. Our work begins today. Let's go. -bo," he wrote. During the service, Bishop Vacti Mckenzie blessed Obama and Vice President Joe Biden while they stood in the front row with their heads bowed. The president shared a laugh with his daughters upon his return to the White House Monday morning. Malia ran up to his limousine and shouted "Boo!" at her father. "You scared me!" he joked as the Obamas entered the White House. Early on Monday, it seemed the District would not not draw anywhere near the number of guests that descended upon the city in 2009. Streets near the White House were busy at 6 a.m., but very walkable despite the large number of closed-off roads and pedestrian-prohibited pathways. In 2009, an estimated 1.8 million people showed up to watch the nation's first black president take the oath of office. Obama already took the oath of office in a private swearing-in ceremony on Sunday.